The Spiral Ladder Climber is a great way to connect different deck heights. Connect between two, three and four decks. 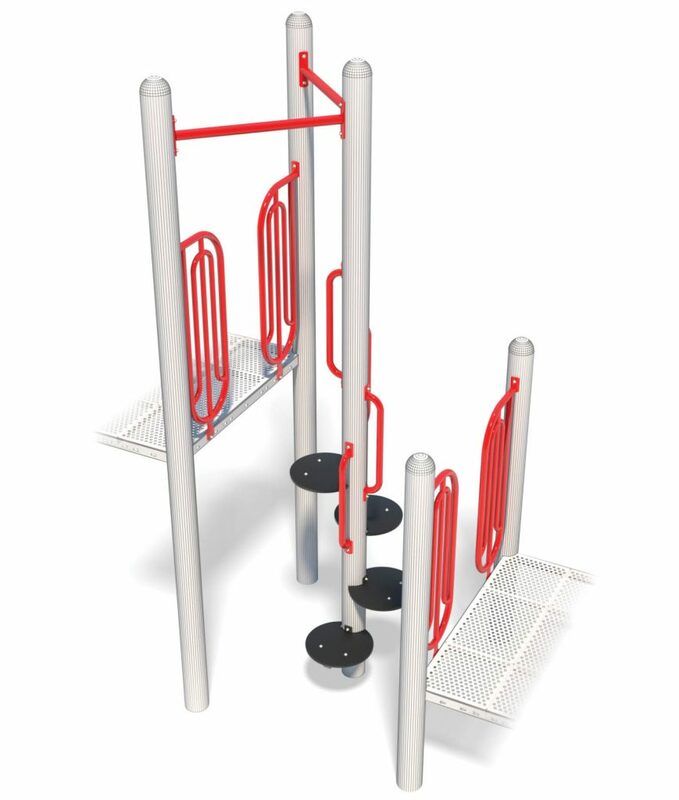 Great climber for kids who love to play the game grounders and other games on play equipment. Spiral step is a mechanical assembly of safety railings, upper connecting bars, grab bars, step frame and anti-skid step. Safety rails are a welded assembly of 1.315” (33mm) O.D. x 12 gauge (3mm) Allied Flo-Coat® galvanized steel tube, 1.029” (26mm) O.D. x 14 gauge (2mm) Allied Flo-Coat® galvanized steel tube, and 0.1875” x 1.75” (5mm x 44mm) zinc-plated hot-rolled mild flat steel. Upper connecting bar is a welded assembly of 1.315” (33mm) O.D. x 12 gauge (3mm) Allied Flo-Coat® galvanized steel tube and 0.1875” x 1.75” (5mm x 44mm) zinc-plated hot-rolled mild flat steel. Grab bars are 1.315” (33mm) O.D. x 12 gauge (3mm) Allied Flo-Coat® galvanized steel tube. Step frame is a welded assembly of 1.5” (38mm) square x 14 gauge (2mm) Allied Flo-Coat® galvanized steel tube and 0.1875” x 1.75” (5mm x 44mm) zinc-plated hot-rolled mild flat steel. Non-skid step is 0.75” (19mm) anti-skid marine-grade polymer. Safety rails, upper connecting bars, grab bars, step frame are powder-coat painted. Connect to 5ft (1.52m) deck as an internal climbing event between decks.